Mahmoud Ahmadinejad believes that the 12 Imam, or the “Mahdi,” will install a new World order. With the help of “Jesus”. Mahmoud Ahmadinejad is always given a red carpet welcome in the United Nations. The Iranian President is a “Messianic Muslim”. He believe that he has to destroy Zionist Israel, so that the savior of the World can return. He is the 12 Imam, who has gone missing. 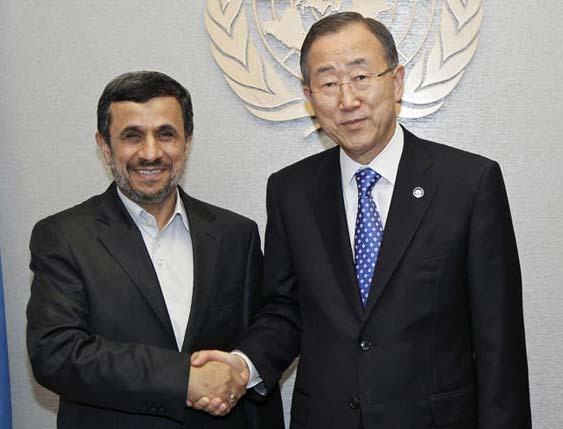 Standing in the pulpit of the United Nations (UN), Mahmoud Ahmadinejad confessed his faith in “Jesus”. Hardly any other World leader have done so. The Iranian President believe that “Jesus” is alive, and that “Jesus” is coming back. But only as a servant of “allah”. The “Jesus” of Ahmadinejad is coming back to tell the Jews and Christians to turn to the “god” of the Arabs and Persians, as he is explained in the Koran. ” Iranian President Mahmoud Ahmadinejad on Wednesday called for the end of the “hegemonic” powers of the United States and Israel, whom he described as “the uncivilized Zionists.” He said the world would ”soon” see new “global management” by the Twelfth Imam, also known as the “Mahdi,” and his deputy, Jesus Christ” . Despite his insistence that the Twelfth Imam’s reign would come without war, Shia eschatology experts say the opposite is true. As I document in my non-fiction book, Inside The Revolution, and dramatize in my most recent political thrillers, The Tehran Initiative and The Twelfth Imam, Islamic theologians say Muslim political leaders today are supposed to set into motion the annihilation of Judeo-Christian civilization as we know it and create the conditions of chaos and carnage to hasten the arrival of the Twelfth Imam. This is a video of the latest speech of Mahmoud Ahmadinejad in the United Nations. Jesus warned us in advance about men like Mahmoud Ahmadinejad. He said that many would come and claim to be the “Messiah” and even deceive the very elect, if possible. Let me remind you that even men like Benito Mussolini and Adolf Hitler believed in “Jesus”. But their copies were also replacement of the Biblical Messiah, one among many antichrists. “Anti” do not mean “deadly against”. Anti means in replace off. Like the Pope being the replacement of the “Holy Father”, not officially against “The Holy Father” whom is God the Father in Heaven. It is a complete disgrace that many pastors and priests do not have the courage to teach their flocks about the most prominent anti-Christ’s who have been introduced as “Jesus” in our fellowships. Not talking about end time deceptions are a deception by it self. A spirit that is not from God is permitted to enter into the sheep of Jesus. Gradually such fellowships becomes useless for the Kingdom of heaven. Not only deceiving them selves, but deceiving others too. Please take this message seriously. Wow stunning does this sound like the anti-christ deceiving many? We (the Body of Christ) have, (must be warned) got to warn all that will hear..those who don’t want to hear will walk away those who want to hear will remain ..
I’ve asked so many What did your Pastor or You speak about in Church today? and 9 out of ten times it’s Prosperity…know your covenant with God and his promises he has to keep his word. or it’s Until you realize that you are a sinner and all this about prosperity is false, Jesus would want us to be in Unity with other religions to help bring about peace in the body and world. The rest is either that and mixed in with Rick Warren or the Catholics are opening their doors for all religions to work together that is Jesus no one else could do that. We all will be Raptured soon…so pray your loved ones and neighbors into the Kingdom before it is too late. I guess nobody translated the bible into Persian. The only help Jesus is going to give to Satan is allow him to do what he’s going to do. This guy really needs to be taken seriously. Tying Jesus into his message only massages the uninformed masses. Combine that with the emerging church doctrines of social justice ( look at the saddleback and willow creek churches) and the railing against Israel will only get worse. Unfortunately it’s needed to get Israel’s eyes on God. The deputy “Jesus” might be the replacement for the Messiah on Earth, the “vicar of Christ”. He also likes to be addressed as “the Holy Father”. The Pope and the fellow who can stop the civil war among the Muslims will surely become the “perfect partners for peace”. I agree, a strong possibility. Ivar, i don’t understand, the ‘advertismet for your books’…? Am I missing something? I mean no disrespect by no means, it just surprises me that in the midst of all the warnings and revelations, teachings, sharing etc about The Word and these Last Days you’re advertising Books about you, like the many hawkers on TV? any book in this World could give, and we’d find out much more indepth when this is all over thruough out Eternity when we all will be sharing and praising Him who saved us by His great grace, mercy and awesome love. Please do not think ill of this inquiry. Nor am I implying you are ‘hawking’ your wares. It is true I have only been coming to this site a short time yet in all that time, you have not sounded like the others who seek to profit on what God did for you? I also did not know that this ‘site’ costs money, that may sound dumb, since there are so many Blogs out there…and Chat Rooms.. Yes there was one time, it was mentioned but not as for selling Books, when you have stated many times you were freeed from Catholicism. At that time I did not feel it was safe to use the Pay Pal thing, and nothing else was offered for any form of help, how little it may or may not be. Please address this for me, so that I am not an offense or a burden to this Ministry and if possible hinder what you feel The Lord has called you to do. You do not have to buy my book to enter the Kingdom of Heaven. But some Christians like to read books. And this is an offer to those who would like to read about an Atheist who have come to faith in Jesus the Messiah. I have published two books. One in 2007 and one in 2011. The fist book have been published in Norwegian, English and Hindi. News That Matters is an open website. You do not have to pay anything to read all the 4.400 stories on this site. I never thought that nor implied that….and no clue where that even came from. I know in whom I trust. I was asking …..never mind…thank you for responding. My reply was a little bit ironic. I hope you can accept that. Let us crack a joke once in a while. I know that you put your trust in Yeshua. You’re right, I too enjoy laughter, quite frequently. I was trying to get more information on how and where to send any support that I may be of any small help. Yet I did not want to do it thru books. I do not send much to many anymore because it’s not as The Word says. where you are fed, and the of Christ you commune with, when you are able and you have the opportunity. Last year I did not. Thus I turned down the opportunity that I only saw on surface with no real instruction on this new (to me) fangled ways of what ?? ..offerings etc. Anyway, regardless, I refuse to let anything whether it be small or great, to hinder any blessing I am able to receive or share, because of my misunderstanding. I hope you’ll accept that as well. Some things I feel is not beneficial for the world’s ears, they are already big enough (smile). Yeah so do I….in fact this morning after I responded to your post, I sat here and listened to the ‘entire’ speech of Mahmoud Ahmadinejad (to) in the United Nations. After praying, not that it would not be but that the Lord’s will would be done. And that those who are seeking Him will be strengthened as well as ‘their eyes’ to be opened for understanding to this. Also thanking Him for allowing us (this generation) to see these things come to pass that He had told and shown the Prophets of old. Now He is showing and revealing them to us…. I’m house sitting and dog sitting this week, and I got a phone call today, well not I, but a recording, for me to leave a message for the family. This is Pastor so and so and you all know this month has been in a ‘Month long “Love” month.’ We will have a ‘Love your Church’ this Sunday and after Services, there will be a Picnic on the lawn, for all. So don’t forget to bring your Lawn Chairs, and a special plate to add to the others so that there will be enough food for all to enjoy as we enjoy the close out with a big “Love your Church” …. After the message, and my heart was breaking, I prayed “How come”…what about what is going on in the World…are we to forget what ‘days we are in’, Women are told to sit down and let the Men handle things, what about the Men who are so ‘gallant with a huge bright toothy smile while they lull you to sleep’ while The Holy Spirit is revealing what He sees and hears to us, the Scriptures being fulfilled right before our eyes….Dear God…and I see Men in here warning and pleading for all to ‘take heed’…keeping a vigil on the things the Lord is doing among us…it reminds me of the Old Testament Prophets who went about ‘telling, sharing, pleading, and even telling the ones who ‘says all’s well and right with the World….Just like today, we’ll get Obama out of Office and take America back and have a Big Picnic celebrating God has won over the enemy….this is the great revival before the Rapture…and it will last a few years…. Oh Lord…we love these people, and yes the ones who are deaf….but they were not always deaf…Do I seek comfort, Do we women seek a repieve from all the terror that is going to happen, do we plead for the eyes to open that are asleep while the Fox is in control of the Sheep…while our hearts are like the Prophet Jeremiah in Lametations watching what is going to and is happening….as we watch like Jesus did on the hill over-looking Jerusalem, I’m told I take things too serious in the Word, ‘let God handle it enjoy life’…I think everyone should sit and listen to that speech of Ahmadinejad, knowing the last time and all the times before his speech has been ”we will destroy Israel, we will push Israel off the map, we will push israel into the Sea…We will Destroy Israel….and Now ”Now he is talking about Jesus coming to bring Peace to the World, for Muslims, Jews, Hindus, Chritians and all Religions of the World…!!! It’s like he is a different man, saying things with a different softer, more compassionate heart (spirit). Blessing everyone also in the Name of God…not in the name of Allah…he kept saying ‘God’…and Jesus…I wonder what the Religious Leaders will say about this change of heart and change of speech about Israel and all nations not fighting but working together in peace. Oh yes, the Bible IS translated into persian! And there are dear brothers and sisters in Iran paying a high price for following Jesus. Pray for them. No, I mean, let’s pray for ourselves, that we will be found worthy to be called THEIR brothers! True, we need to pray for Christians in Iran and many other countries that persecute followers of Jesus. I recently saw some videos of house churches in Iran and had no idea ealier that there are so many Christians there and the numbers are increasing daily. Praise God! From what I understand Islam has two major branches, Shia and Sunni. Their end time scenarios have some differences, mostly in the appearance of the Mahdi. This link is to a video, done in Iran, that explains their view. This is the driving force behind the regime in Terhan. It is a firmly held religious belief and molds their outlook and actions. It’s good to know and gives an understanding of what the say and do. Some people see the Mahdi and the Muslim Jesus as the antichrist and miracle performing false prophet. For myself I’m just going to watch and pray. We will kmow soon enough who they are. I think everyone in the media is making a grave mistake by (censored) on what President Ahmadinejad is stating. It boils down to one of the stated facts and prerequisites in the Holy Bible KJV. This is not exact, verbatum but from memory. It’s Gods message delivered by Jesus pertaining to a prerequisite to Gods forgiveness & entering into Heaven. YOU MUST LOVE YOUR BROTHER. YOU MUST FORGIVE YOUR BROTHER (I’m so upset right now I can’t remember the # of times 7 x 70 at least) ISHMAEL & ISAAC were BROTHERS. They were both sons of the JEWISH PATRIARCH ABRAHAM. I was born on IRAN’S annual holiday & as convoluted a it sounds. One year I was so miserable & persecuted for my CHRISTIAN beliefs in my own ONE NATION UNDER GOD country where the IN GOD WE TRUST is printed on the back of our currency ($1.00 bill) I felt it was a gift to my soul. A personal gift that delivered a unexplainable comfort a few years back when I found out MY NOVEMBER 4TH BIRTHDAY was celebrated by IRAN. Then on learning when & bad kidnappings I concluded that was how long Iran has been waiting for the major countries & Nato etc. to tell the people the Truth. President Ahmadinejad it’s would appear a useless endeavor. I would/will witness to Jesus for you. I believe you & (censored) I feel unworthy &; dirty and like I shouldn’t be reading rhe contents of your speech. I say save your country before all the true believers are tainted. Nuclear suicide end the suffering that (censored) Thankyou for the dream of the mother & baby camels named Mine & Ours. I had willingly sent them to Russia but I’ve taken them back. On & on & on.